Sony has had a bad year but TVs and tablets will help it bounce back, says CEO Sir Howard Stringer. ‘Flattened, flooded, hacked and singedâ€™ â€“ that was how Sir Howard Stringer, the boss of Sony, described his companyâ€™s past year. With the Japanese tsunami, a PlayStation â€˜crisisâ€™ and the London riots, the firm has announced $2billion profit rather $4billion, but at this yearâ€™s IFA show in Berlin, Sir Howard said Sony was finally ready to â€œre-engageâ€. Few better ways of doing that, then, than launching the two tablet devices that stole the show. 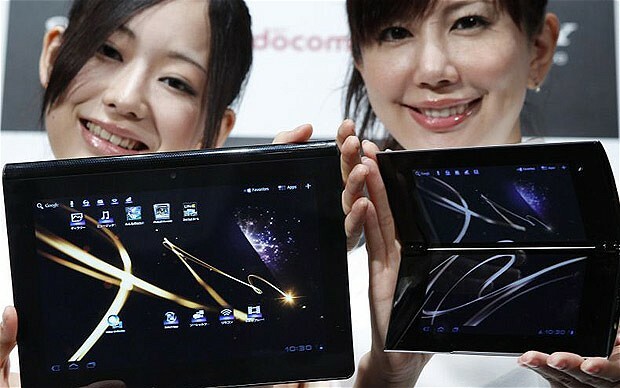 But the new â€˜Sâ€™ and â€˜Pâ€™ models â€“ one a 9.4â€ tablet and the other featuring two screens that fold together â€“ are entering a crowded market of tablets based on Googleâ€™s Android operating system whose sum total has been called â€˜little more than a rounding errorâ€™ when compared to iPad sales. And all coverage of Sonyâ€™s business is still dominated by television sales: the only division of the company not to make a profit, thereâ€™s even been talk among commentators of the firm leaving it all together. Kazuo Hirai, Sir Howardâ€™s right-hand man and executive vice president was clear, however: â€œWe are not leaving the TV business, we are not thinking of leaving the TV business, we are not talking about it eitherâ€. Sir Howard himself talked of transforming Sony over the last five years â€œfrom an analogue company to a digital oneâ€. Now, he says, it is set â€œto use content as a weaponâ€. Indeed, the new tablets, mix a new approach to digital music and video with innovative hardware. The S tablet especially is finally seeking to answer the question that has dogged â€“ but not held back â€“ Appleâ€™s iPad: â€œWhat do I need one for?â€ Many users have continued to see tablet computers as lovely fashion accessories, which are great for browsing the web on the sofa, reading books and magazines on the move and playing the odd game, but they donâ€™t do much that is not available elsewhere. Sony, instead, is keen to use its devices to either replace others or to tie together the existing mess of other bits of electronic kit that many users already have at home. The tactic, at least, sets the company apart from its main rivals. Even the folding, two-screen P design is appealingly different, hoping to slide into a womanâ€™s handbag or a manâ€™s pocket.